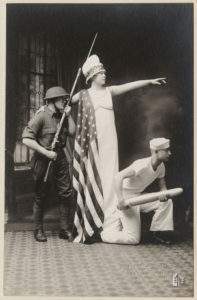 The Los Altos History Museum is proud to be one of a handful of museums nationwide hosting a special exhibition created by the National Archives during the centennial observation of US involvement in World War I. The US involvement in World War I lasted from April 1917 until November 1918, but in that time almost 3 million U.S. soldiers were drafted. Please click on the above links to view the details and precise locations for each program, as a number are held at sites other than the Museum. Curated by the National Archives in Washington D.C., the exhibition looks at “The War to End All Wars”, which ravaged Europe from 1914 to 1918. That time period is also when Los Altos was coming into its own, as orchards multiplied, the train came to town, and everything began to boom. It looks at how that far away conflict impacted the everyday lives of communities across the U.S, with new businesses getting started, aid drives, and a growing awareness of international affairs and U.S. global responsibilities. The exhibition will be augmented with stories of local figures who were involved with and impacted by World War I, including the Duveneck and Cranston families.